No Score is the first of four novels featuring Chip Harrison, and they all bore the lead character’s byline when they first appeared as paperbacks from Gold Medal Books. The working title of No Score was The Lecher in the Rye, which sums it up well enough. I don’t know why they asked me to write this. Somebody’s original brilliant idea was for me to write an introduction to the new edition of No Score and Chip Harrison Scores Again, and I said OK. Don’t ask me why. Then somebody else got the bright idea of calling the double volume Introducing Chip Harrison, which meant that I would be saddled with the job of introducing Introducing Chip Harrison, and I said that, if you really want to know, I’d rather go into the bathroom and squeeze a pimple. So they said OK, we’ll make it an afterword, and I said OK again. Don’t ask me why. It’s not as if I was getting paid for this. Chip Harrison needs no introduction, and I don’t suppose he needs an afterword either, so you can stop reading right now . . . If you’re still with me, I just want to tell you that these are my kind of books. Chip Harrison is a sort of a lecher on the wry side. More than that, when you finish the book you want to call him up and talk about it. Listen, I’ve got a tip for you. Don’t do it. Years ago I wrote a book and said how sometimes I wanted to call the author in the middle of the night, and this guy named Ottinger had his name down as author and so many weird kids called him up in the middle of the night that the poor guy lost it. He went up to Maine or Vermont and quit writing and only leaves his house once a year. He always sees his shadow, and it's always six more weeks of winter. I wouldn't want that to happen to Chip Harrison. I've already read the rest of the books, and I know that Chip went to work for Leo Haig and takes care of tropical fish when he’s not helping Haig solve crimes. If you haven’t read those books, go out and get them right now instead of wasting your time reading this crap I have to write. Anyway, I like old Chip. I think Phoebe would like him, too. And I hope you liked him, but if you didn’t, well, tough. What do you expect me to do about it, anyway? Oh, yeah. The business about the name. 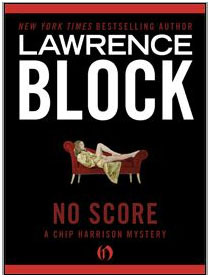 Lawrence Block is now listed as the author of the Chip Harrison books. They had Chip’s name as author originally, but now they’re supposed to be by this Lawrence Block. Same as my book is supposed to be by old Ottinger. Well, I don’t have to believe that if I don’t want to. And neither do you. Lawrence Block has published more than 100 books, including four bestselling series, as well as dozens of short stories, articles, and books on writing. He has received many awards in the U.S. and abroad and was named a Grand Master by Mystery Writers of America. This post first appeared on Poe's Deadly Daughters in December 2010, and is repeated here with permission from the author. Thank you, Hilton. I am going to do a diagram now and try to figure it all out. But mystery is what we're all about and I look forward to meeting Chip. Well, Hilton - very happy to meet you and I must admit you've gotten me interested in reading what Chip has to say ... or is it what Lawrence Block has to say? MJ, can I see that diagram when you're done with it, please? Hi, Hilton. Thanks for introducing us to Chip, and I promise not to call him up in the middle of the night after I've read the book--though yes, that is a temptation, and I'm sure the folks here are either nodding or rolling their eyes. Now I'm going to buy the book. Ha! What a great write-up! I'll definitely give this one a try.